Every day, I read dozens of articles on finance and economics and I am amazed that the mainstream media continue to publish articles written by the so-called financial experts and Nobel Laureates such as Paul Krugman which are essentially mumbo-jumbo and nonsensical FED speak especially issues relating to deflation and inflation and financial bubbles! Let me explain in simple common sense language. Get a balloon. The usual size is about 1½ inches in diameter and about 3 inches long. Now blow into the balloon until its diameter is about 8 inches. When you do this, you are inflating air into the balloon. Next, release the air slowly and observe how the balloon shrinks in size. You are deflating the air out of the balloon. When the air is completely released, the rubber balloon returns to its normal pre-inflated size. If and when you continue to inflate the balloon beyond a certain diameter (normally 9 inches), it will explode because the rubber balloon has been stretched beyond its limits of sustaining a given volume of air that it can hold. The bursting of the balloon is inevitable. Inflation, v.t. : distend with air or gas; puff up; (finance) resort to inflation of the currency; raise (price) artificially. So inflation n. – undue increase in the quantity of money in relation to goods available for purchase. Deflation, v.t. : Let inflating air etc. out; (finance) reduce the inflation of (State’s currency). So, what is so difficult about understanding inflation and deflation? But, the FED via “Greenspan-speak” and “Bernanke-speak” comes out with all kinds of mumbo-jumbo and nonsense and this is repeated and analysed by the so-called experts and Nobel Laureates just to confuse Main Street and Joe Six-Packs. Common sense tells us that when we go shopping for food, clothes etc. we seek out the cheapest price – e.g. why pay US$10 for a face towel when you can have the same for US$1? When the price of a product goes down, we are happy and relish the fact that the dollar in our pockets would buy more of the same product. Therefore, deflation is good! Common sense tells us that when a product sells for US$1 but, over a period of time (e.g. six months or more) goes up to US$2, something is not right. We invariably complain that things have become more expensive and the dollar in our pockets would purchase much less of the same product. Therefore, inflation is bad! This is commonly referred to as price deflation and price inflation. Have you ever wondered why the FED, central banks et al consider deflation as dangerous and they must do everything to avoid / prevent deflation? Have you also wondered why the FED, central banks et al set targets for higher inflation? In “FED-speak” this is commonly referred to as asset deflation and asset inflation (See Steps Four and Five below). To answer the above two questions, please read Steps One to Three again and ponder. Let me explain again in simple common sense language. If you have the correct perspective and understanding as to the primary beneficiaries of FED’s and other central banks’ policies, then it is simple to understand why FED considers deflation must be avoided and or prevented at all costs and inflation to be jacked-up and tolerated to a specific target / level. In essence, deflation and inflation has to do with “credit money” and debts and the collaterals that support such debts. It follows from the above statement, that the primary beneficiaries of the FED’s and other central banks’ policies are the Too Big To Fail Banks (TBTFs) and the Too Big To Jail Banks (TBTJs), the hedge funds, the speculators, the global derivative casino etc. A simple debt transaction will illustrate why to the FED, deflation is a scourge. Assuming you have an asset – a property or shares quoted in the stock exchange. When you borrow money from a bank, you need to provide security / collateral for the loan. Normally, for a property mortgage, the bank would extend up to 80 per cent of the value of the property. Thus, if your house is worth US$100,000 you may get a loan of US$80,000. In the case of public quoted shares e.g. General Electric, Microsoft etc. the bank usually extends a loan not exceeding 60 per cent of the value of the said shares. Thus, if the value of the share is US$100 per share, a loan of US$60 per share multiplied by the number of shares pledged may be extended. Therefore, it serves the interests of the financial elites to have the value of such assets to be inflated because this would enable you to borrow more money from the same asset. So, if the value of the house or the shares were to double, you may be able to apply for a second mortgage on the house and or the limit on your share trading account may be extended. Therefore, bubbles are created to serve one purpose and one purpose only – to enrich the financial elites. And it matters not to them when the bubble bursts (i.e. in the boom and bust cycles) as in either event the elites will benefit. When the bubble bursts (the price of assets plummets) there is deflation and because of this the financial elites are in financial danger. Deflation in this sense has nothing to do with the drop in price of necessities etc. as explained in Step Three above. What are the immediate consequences of asset deflation when the bubble burst (as it must do so, and as explained in Step One above)? If the share price plummets from US$100 per share to US$20 and the house price is down to US$60,000, then and in such event, the collateral / mortgage supporting the loan would be less than the loan extended. So, if and when the borrower defaults, there is not enough value in the collateral to cover the loan and the bank would suffer substantial losses. The entire financial system would suffer trillions of dollars in losses. balloon) so as to earn obscene financial profits and to corral the entire Main Street into debt slavery. The book value of the loans of the entire financial system which was once worth US$ Trillions is now worth a small fraction, a few hundred US$ Billion. As a result, a fraud must be perpetrated – to hide and falsely declare the true value of the mortgage / collateral. Instead of marking-to-present depressed market values, the banks are allowed by the FED and other central banks to treat such mortgages and collaterals as having its original values at the time when it was secured to the TBTF and TBTJ banks. And when this fraud was exposed, the FED and other central banks came to the rescue by buying from these TBTF and TBTJ banks these depressed assets (which have become toxic / junk, and some were rated AAA when in fact junk). Additionally, the FED and the other central banks began inflating digitally the money supply and pump these virtual monies (created by a click of the computer mouse) into the financial system. This takes the form of a book entry in the central banks’ computerised ledgers! Therefore, deflation, specifically asset deflation is bad for the financial elites and must be avoided and prevented at all costs, even though they are the culprits that created this catastrophe. But, inflation, specifically asset inflation (creating a post crisis bubble by artificially raising the price of the deflated assets) by digitally printing more money and pumping into the system is good, because such monetary policies help the banks to escape the punishment of bankruptcy! By claiming that deflation is bad and inflation is good (as explained above), the FED and the other central banks have pulled a con on Main Street and turned the true meaning of deflation and inflation as commonly understood by Main Street on its head. When there is a boom (artificially created by central bankers), the TBTF and TBTJ banks reap exorbitant and obscene profits at the expense of Main Street. The owners of public-listed companies (and all the insiders) likewise reaped huge profits when they unloaded the shares and it is the retail investors (suckers) who invariably bought at the high end of the market cycle that suffer the massive losses when the bubble burst. When the bubble burst and the market crashed, the retail investors (suckers) suffer massive losses with the added injury and insult that they were left high and dry whilst the TBTF and TBTJ bankers were bailed out and “bailed-in” and paid hefty bonuses totalling in the hundreds of US$ billions! It is about time that Main Street wise up to the fact that they have been conned time after time by “FED-speak” and financial nonsense. For a start, stop listening to and stop reading the financial / economic dogmas spewed out by the so-called financial experts and Nobel Laureates. Use common sense and approach to understand such basic issues not by reading books filled with technical jargons and mathematical models that do not reflect reality, but reading from a simple dictionary and talk to your mother, grandmother i.e. home makers who in their daily lives confront the harsh realities of seeking bargains to add more onto the table and avoiding pricey goods so as to save more for the future. Finally, confront your representatives in Congress, Parliament, State Assemblies etc. and demand from them, why they are promoting policies that sustain the myth that deflation is bad and inflation is good, when in reality, we at Main Street want cheaper goods and services and low inflation. Millions from Main Street have made paper profits over the years and some were able to cash-in some of the profits, but most suffered horrendous losses (when told to hold for the long term) when the crash came suddenly. 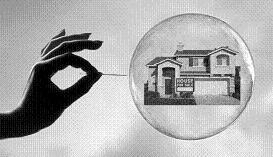 It was sudden to them because they chose to ignore all the signs that a financial bubble (like a balloon inflated to a point that cannot be sustained) would inevitably burst! Boom-and-bust cycles were created by the financial elites and justified by economists to fool Main Street so as to enable the 1% to plunder and transfer enormous wealth from Main Street to their off-shore havens. Ironically, the most spectacular case of bull market mania was Microsoft. Undoubtedly one of the greatest capitalist enterprises of all time, it dominated the ecosystem of an entire industry – the personal computer – like never before in history and had the financial results to prove it. During the last twenty years its sales have risen from $2 billion to $70 billion, and its current net income of $25 billion per year represents 17 per cent compound rate of annual growth since the mid-1990s. But, the Greenspan bull market carried Microsoft’s market cap into the realm of sheer lunacy. Valued at about thirty times its very promising earnings in 1990s, its market cap of $6 billion then traced a parabolic upward curve, rising a hundredfold to$600 billion by January 2000.
and under the circumstances was nothing less than delusional. By that point in time, Microsoft had grown to $24 billion in annual sales and recorded $10 billion of net income. Even at an implicit PEG ratio of 2.0x, its market multiple at the bubble peak implied that within a decade, that is, by fiscal 2010, Microsoft’s net income would have grown at 30 per cent annually and reached $150 billion. The implied figure, alas, was larger than the global sales of the entire personal computer industry at that time. Needless to say, Microsoft’s income grew by 6 per cent per year, not 30 per cent over the next decade to $18.5 billion; that is, its net income grew by about 2x rather than by 15x gain that had been implicit in its valuation at the tech bubble peak. Today, Microsoft is still valued at only about $200 billion, meaning that at the peak of the mania in 2000 there has been about $400 billion of bottled air in its share price. The FED might have been better advised to dissect the bubble’s deflation, not promote a new one. It would have found that the Greenspan stock market mania had led millions of investors to embrace the instant riches of stock market gambling, when the very paragons of that mania – the dozen high-flyers – produced only 2.5 per cent compound price appreciation over the last sixteen years. Yet, instead of coming clean and embracing sound money policies which would have induced the American middle class to revert to frugal living and saving for retirement, the thrust of FED policy since the dot-com crash has been to perpetuate the lie. Accordingly, the massive baby boom generation that desperately needed to save has remained enthralled to the financial delusions that the Greenspan FED foisted on the public. Unfortunately, this wrong-headed policy has not only made the Federal Reserve a hostage of Wall Street, but it also has warped and deformed the very foundation of the nation’s economy. Having fostered a bull market culture of stock gamblers during the 1990s, the FED simply broadened the casino’s offerings after 2001 to include housing, real estate, and derivatives. By so doing, it kept the party going for a spell, but in the process implanted the most pernicious possible error in the workings of the American economy; namely, the belief that savings out of current income is unnecessary and even counterproductive because higher savings would allegedly reduce consumption expenditures and the rate of GDP growth. Under the Fed’s new prosperity management regime, by contrast, the build-up of wealth did not require sacrifice or deferred consumption. Instead, it would be obtained from a perpetual windfall of capital gains arising from the financial casinos. In this manner, the historic laws of sound finance were mocked by the nation’s central bank: households would grow steadily richer, even as they enjoyed the luxury of borrowing and consuming at rates far higher than the sustainable capacity of their incomes. The bull market culture had now totally deformed the free market.